Something Old, Something New, Something Borrowed, Something Blue and so Much to do. 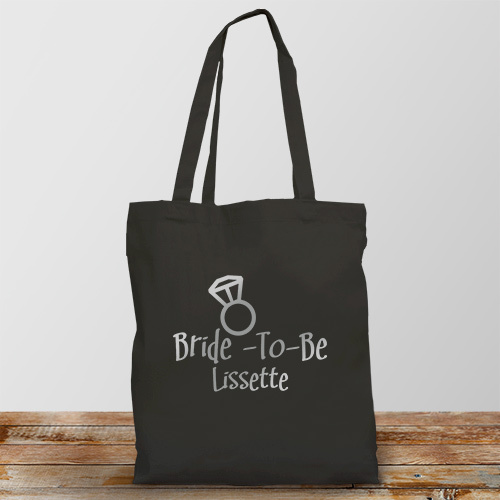 How about keeping everything together in our Personalized Bride Tote Bag. This sturdy, black tote bag is sure to be her favorite while planning this once-in-a-lifetime event. Our 100 % cotton Black Tote Bag measuring 16" h x 14" w is made to hold all your wedding planning items. Includes FREE Embroidery! Personalized your Bride To Be Tote Bag with shiny silver letters with any bride's name. Very satisfied with the bag. Your products are always great. I am a little dissatisfied with the gift wrap. I used this service for the first time as I was unable to attend the function. My son said the gift wrap was VERY plain with no pizzazz. I guess I will not use this part of your service again. Otherwise was pleased with the gift. Happy with this tote. I was impressed with the quality. GiftsForYouNow.com offers a wonderful collection of Personalized Tote Bags for Nana, Grandma, Mother, Sister & Aunt. Create a Personalized Gift for a special Birthday, Mother's Day, Anniversary or Christmas. GiftsForYouNow.com Personalized Canvas Tote Bags are personalized FAST & EASY. You will love the quality and fine craftsmanship used to make every personalized gift.